Wolves, lions and other large carnivores rely on meat for sustenance and there are only so many wild animals to go round. Sometimes, dinner means cow or sheep. Farmers can use guard dogs or protective fencing to deter predators and protect livestock. But lethal methods such as hunting and trapping are also used to control wild carnivore numbers. As a livestock farmer in wolf country, it would be reasonable to assume that killing more predators would result in fewer attacks on your animals. However, a new study by Washington State University has turned this assumption on its head by discovering the opposite: the more wolves that are killed (up to a threshold of 25% of the population), the more the remainder preyed on local sheep and cows. Why is this? The researchers, Robert Wielgus and Kaylie Peebles, point to the nature of the species’ social systems: wolves live in family groups containing a breeding pair (also known as the alpha pair) along with related sub-adults, juveniles and pups. The alphas are the only breeders within the group as they limit reproduction by their subordinates. Killing one of the alphas disrupts the pack and subordinate wolves, who often outnumber the breeders, are then free to reproduce. This could increase the number of breeding individuals in the area, thereby increasing the population of hungry wolves – maybe farmers who shoot wolves are inadvertently doing more towards conservation than they think! 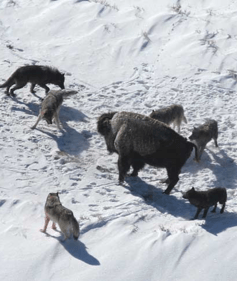 Wolves take on a Bison. Conversely, as humans are more likely to shoot youngsters than adult breeding wolves, the alphas may be temporarily be in a more favourable situation. 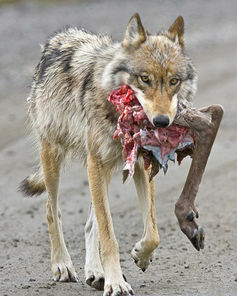 There would be less competition for food, fewer clashes with other wolves and less risk of the transmission of disease. Again, this could result in short-term increases in attacks on livestock. Wolf packs also have an important educational role, as the experienced wolves pass on their knowledge. Killing them impairs this social learning. If the rest of the pack hasn’t learnt the skills necessary to take on bison or elk they may instead turn towards easier pickings on the farm. This same behaviour has been seen in lions and cougars (although has not been documented in many other carnivore species). It is interesting to note that this paradoxical finding is not just found in relation to wolves – lethal control of cougars (or mountain lions) also means the remainder kill more cows and sheep as younger, inexperienced cougars are more likely to attack livestock. Coyotes also show increased litter sizes and more frequent breeding in populations that were lethally controlled. Culling programmes could have even exacerbated livestock attacks by taking out younger, less predatory coyotes. 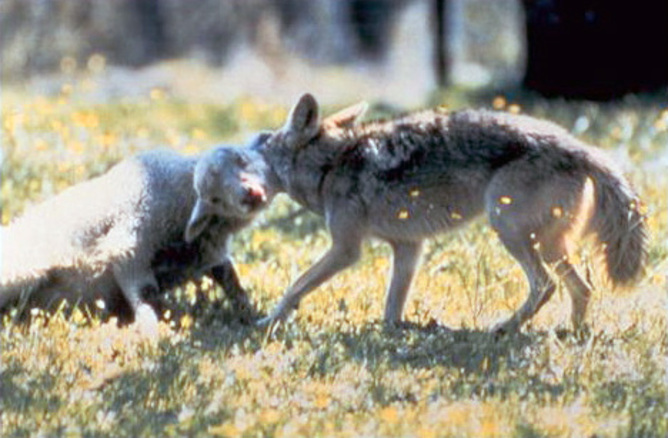 Further, state-funded coyote removal campaigns have failed to reduce predation on sheep. Lynx, too, do not significantly reduce livestock attacks until lethal control dramatically reduces total population numbers. It must be noted that other studies have shown that killing predators can sometimes reduce the numbers of livestock they themselves kill, but this is only temporary, until new populations of predators establish themselves. What to do about wolves? If we would like a world where neither livestock nor predators are killed, we are either going to have to take away all the predators or all the livestock. Clearly neither one of these options is viable so we must aim to reduce preying on farm animals to a tolerable level. Despite proof that changes in livestock husbandry reduces predation, farmers may still not want these creatures living near them as they may feel that the carnivores have “won” or taken over “their” land. As such, despite scientific evidence showing that predators don’t kill that many cattle anyway, that lethal control usually doesn’t reduce attacks, and that non-lethal methods can almost eliminate attacks, this still may not be enough to sway farmers from their anti-predator mind-sets. We must therefore start to think outside the box. Much of this conflict between humans and wild predators is not really about protecting livestock, but instead concerns a deeper historic and cultural aversion to wolves, lions and other scary carnivores. This won’t be fixed through simple technical solutions – and we now know it certainly won’t be fixed with a gun.